Colorado Marijuana: Has John Hickenlooper Become a Believer? John Hickenlooper said that, if he’d had a magic wand, he would have reversed the legalization decision in Colorado before it was implemented. However, since the people had clearly made their voices heard, he felt it was his job as the governor to stand aside and give residents what they’d all voted on, despite the dire consequences he felt would come as a result of this decision. As we all know, the doom and gloom predictions never manifested. Colorado has not become a haven of criminals and drug addicts, and the citizens haven’t succumbed to a wave of terrible circumstances wrought by pot’s easy availability. In fact, the legalization of marijuana has been an unquestioned boon to the state. From increased tax revenue to reduced arrests, the overall effect has been positive. There have been individual negative events, but the end times predictions that children would be smoking pot on street corners have dissipated like mist under the morning sun. And, interestingly enough, Hickenlooper has gone on the record to talk about how the Sword of Damocles never falling has changed his feelings on legal marijuana, according to the LA Times. Colorado Marijuana News: Has The Governor Come Around? While Hickenlooper admits there are still issues he’s concerned about, such as the federal government’s continued classification of marijuana as a controlled substance on par with heroin, his views of legal marijuana have changed as the noble experiment has gone on. The facts of what’s happening are impossible to argue with, especially when what you think is going to happen doesn’t actually happen. 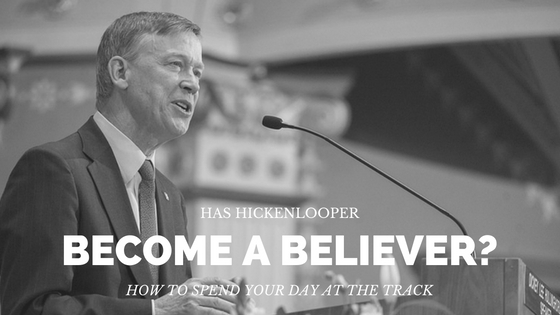 While there’s still work that needs to be done to ensure that the laws meet the health and safety needs of the people, Hickenlooper might be on his way to becoming a believer. Celebrate that it’s legal – find the best deals and dispensaries here. How Much Does Marijuana Prohibition Actually Cost?